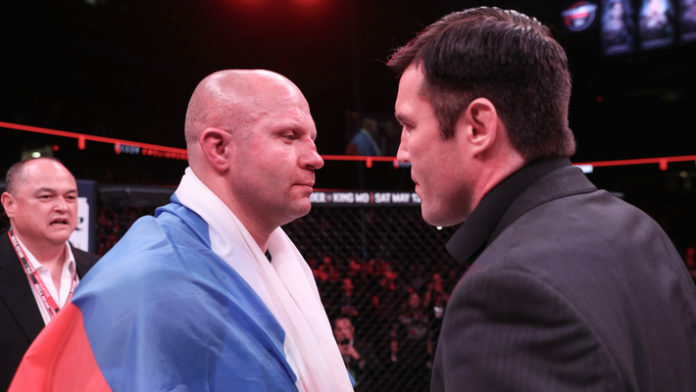 “I’ll clarify it: PRIDE was fixed,” Sonnen told MMAjunkie at the Bellator 208 open workouts “That’s not to say his fights were fixed. PRIDE was so long ago I can’t believe people are still talking about it. PRIDE had fixed fights, and that’s the way it goes. If you fix one fight your whole organization is ruined. I think it’s one of the reasons that they’re off TV and they’re out of business and they’re not doing it anymore. “As soon as they say, ‘Go’ I’m going to come across the ring and I’m going to get in a fight,” Sonnen said. “I’m looking forward to it. I don’t know if I’ve ever looked forward to a fight before. I look forward to opportunities and matches and strategizing and planning and training, but the actual competitions, I am looking forward to grabbing a hold of him and seeing what happens. Bellator 208 takes place this Saturday from the Nassau Veterans Memorial Coliseum in Uniondale, N.Y and will air on both the Paramount Network and DAZN. What are your thoughts on these Chael Sonnen’s clarified comments?